What a beautiful vine! 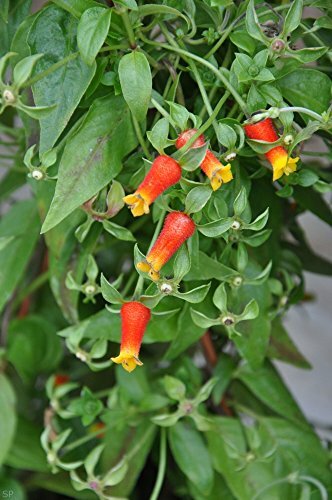 The firecracker vine (Manettia inflata), also known as candy corn vine, cigar flower, is a gorgeous two color perennial flower that goes well in every garden. 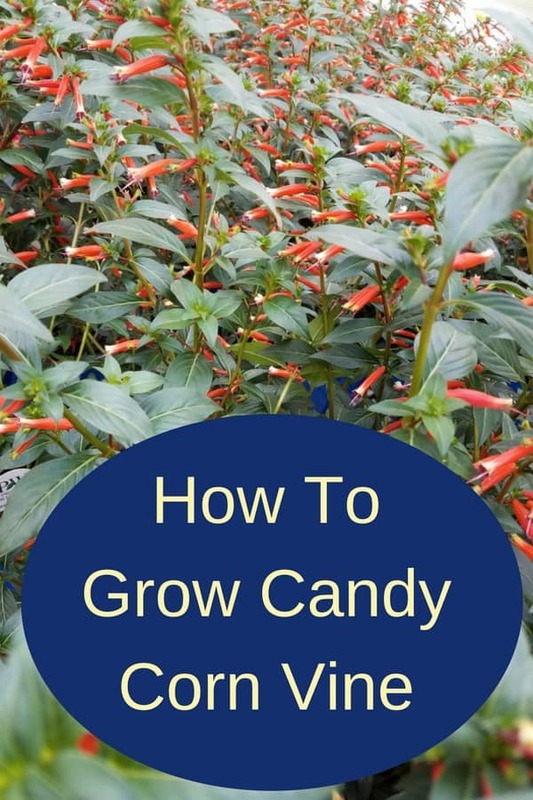 Growing candy corn vine is quite easy, and this plant rejuvenates easily after taking cuttings. Where does candy corn (manettia) vine grow? Manettia will thrive in a shiny south or west window as long as it has enough water and humidity. Given the right conditions, this plant can flower all year long. 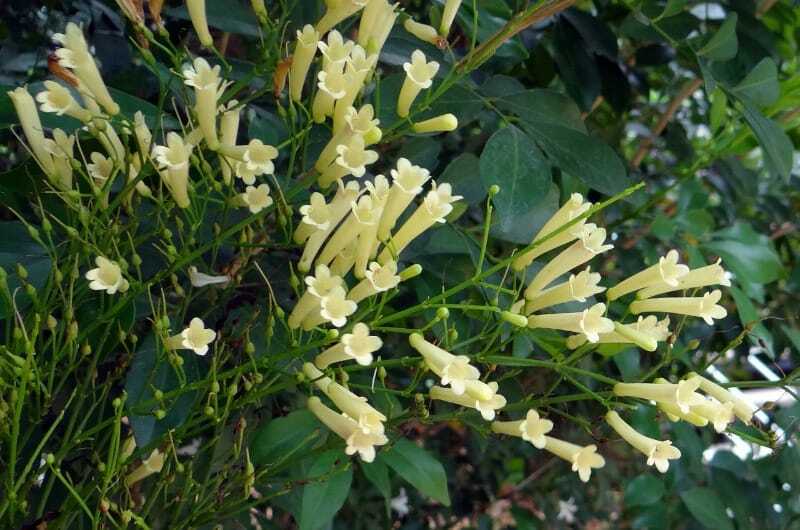 The firecracker vine grows in the tropical regions of Central and South America, where it can be seen climbing up the tall forest trees to reach the sunlight. 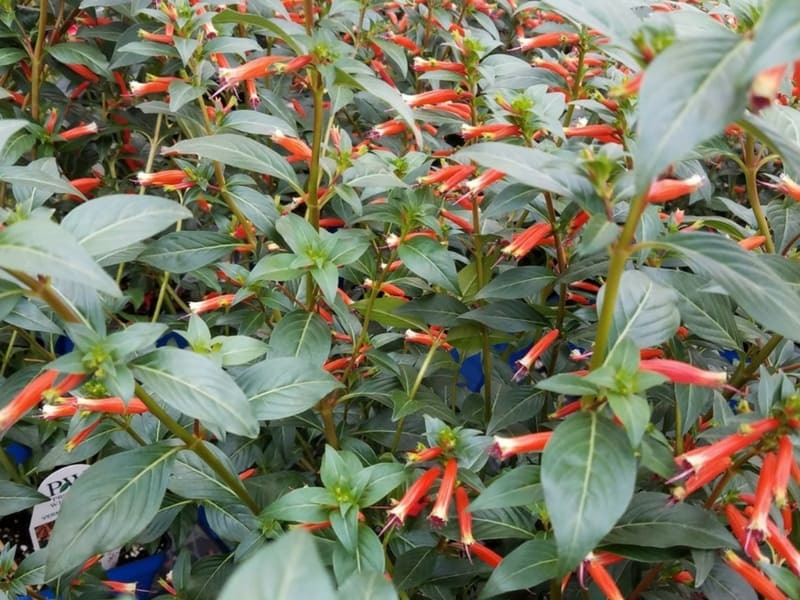 This plant was named after italian doctor Saveno Manetti, who was the director of the botanical gardens in Florence in the 1700’s. The plant was later brought in England, and by the middle of the 1800’s, it had achieved enormous popularity. The oval leaves of this elegant plant are held by slender stems. The soil must be kept evenly moist without ever being soggy, and the plant will do best in good sun (but protected from hot, burning rays). It can be trained on a trellis or grown in a hanging pot. The flowers are bright, glowing firecrackers! 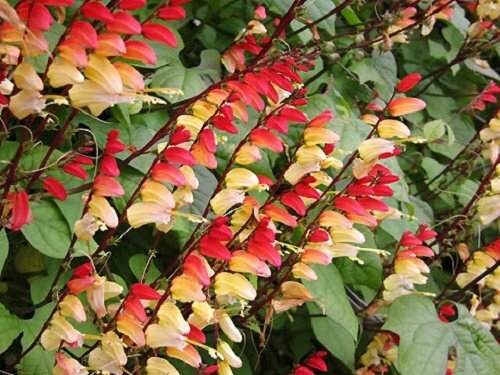 The common name of Firecracker Vine certainly suits this plant. The hairy scarlet flowers are tubular in form, tipped with yellow, and fairly glow in the sunlight like a firecracker ready to explode! The natural environment of the Manettia is warm and humid, so try to copy these conditions in the home if you want your plant to thrive. Mist it frequently during daylight hours, and grow it over a wide saucer of damp pebbles. Manettia inflata is grown in greenhouses, and can flower all year round. It is native to Uruguay, and has hairy stems and leaves. Manettia bicolor can also flower profusely, but it is really at is best from March-September. This species is especially fast growing. Manettia is a very easy plant to grow in the home. It needs good sun, but also protection during mid-day in spring and summer. Humidity is also a must, and keep the plant out of drafts. Expect bright, eye-catching flowers as a matter of course if its simple needs are fulfilled. Take cuttings from mature stems. Do this in March, and place the tray of cuttings over a radiator or some other source of warmth. Cover the cuttings with glass or plastic wrap. 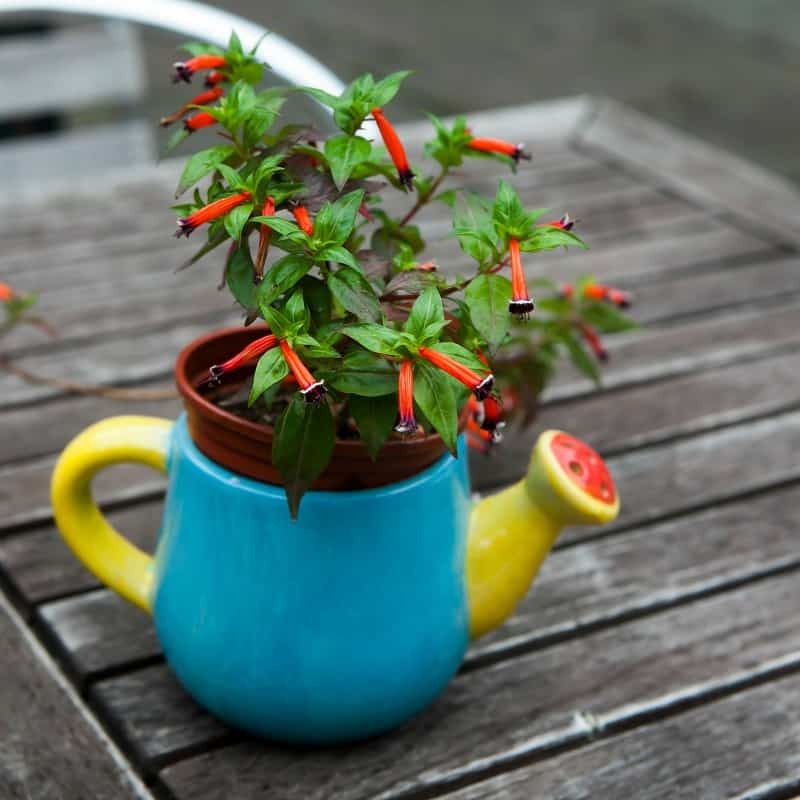 Once the small plants have struck root and have started to grow, move them to small pots of well drained soil. These plants will soon be 12-20 inches tall. After a year, groom the plants (by cutting them back) to ensure a good shape. Although Manettia will support its own weight, it will be appreciate a trellis or frame to climb over. It is important to make sure that the plant has enough humidity. Mist is often during daylight hours, but not during the gloomy, sunless days of winter. Another good way to increase humidity is to give the plant wide saucers or damp pebbles to grow on. Don’t let it stand in water for any length of time, or the roots will rot. Keep it in a warm and sunny spot. If watering and feeding needs are regularly attended to, the plant will develop good growth and a bounty of flowers. Sudden leaf drop, or the flowers don’t develop is caused by too much water at too low temperature. Dry the Manettia out in a warm, bright location and cut down on the water. Certainly water sparingly until new leaves have grown again. If the leaves turn yellow and the plant stops growing, it’s a sign that the plant needs nourishment. This often happens during the period of rapid growth in the summer. Mix liquid food in the water, but at ½ strength only. White insects underneath the leaves can be white-fly or mealy bug. Isolate the plant so the insects don’t infect other plants, and spray it with an insecticide 3-4 times at 3-4 day intervals. Pale spots on the leaves and drops of excrement on the underside are both signs of aphid attack. Spray with an approved insecticide. The Manettia will usually live for many years. It rejuvenates itself quickly after clipping back, or when cuttings are taken. It will cover a small structure in one summer, in the right conditions (plant in shade ;)). Quick tip: take cuttings in late August and grow the vine in the house over the winter. You can try to find candy corn vine plants at your local gardening store, but if they don’t carry it, you can always turn to Amazon. They have both seed and plants. 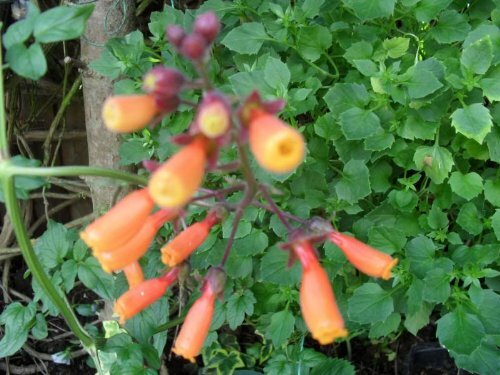 I wish I found better pictures of this plant, when it looks just like candy corn! I’ve seen it, but didn’t think to take a picture. If you have one you’re willing to share, please contact me here. 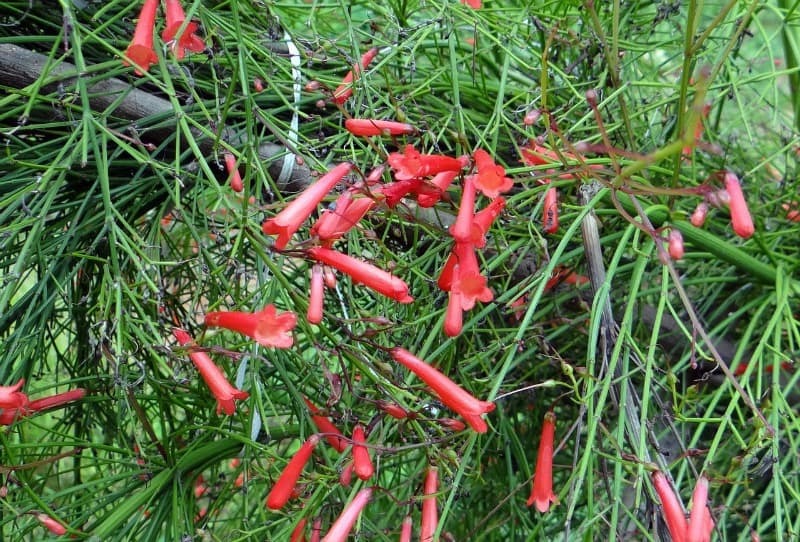 These are unusual firecracker plants. They are usually red, or pink, or bi-color (red and yellow). So pretty!